20 points of piles are seen installed in order to smoothen an anchoring pool and improve the pier on Lancang Island. The total installation that reaches 66 points will be complete in the next three weeks.
" Of 60 points, 20 out of them have been installed. Thus far the work has touched 15 percent"
"Of 60 points, 20 out of them have been installed. 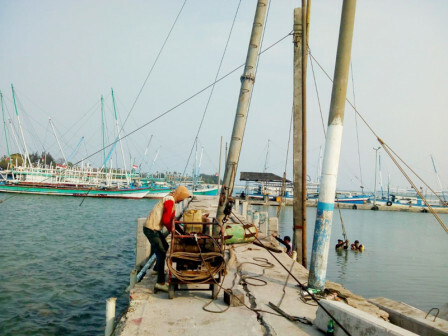 Thus far the work has touched 15 percent," expressed Suherman, Section Head of Facility and Infrastructure Section for Seribu Islands Transportation Sub-dept., Friday (10/5). After pile installation, it would be continued with plate installation for floor molding and casting. The work itself until now is in accordance with planning. "We believe it will finish in mid-December," he said.